How Do You Store Bare-Root Strawberry Plants? Storing bare-root strawberry plants is best avoided. If possible, strawberry plants do much better in the ground and protected from cold winter temperatures. But, situations arise where the strawberry plants just can’t be in the ground. If strawberry plants were ordered in the fall and were, for whatever reason, not able to be planted, the options are to let them die or store the bare-root plants. 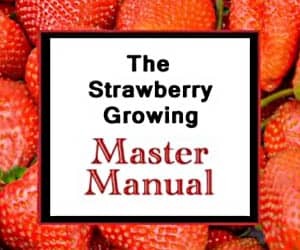 And, if plants are dug after dormancy has occurred, storing bare-root strawberries in an “intermediate” state may be the best option to keep them alive. 1. Cover up the plants’ bare roots! Strawberry plants can’t survive if their roots are exposed for an extended period of time. They will dry out and the plants will subsequently die. So, the first order of business when seeking to preserve the life of your exposed plants is to bury those roots! Any moisture holding medium is sufficient, but it is ideal to use one that is easy to separate from the roots when planting time rolls around. I recommend sand. Also acceptable are clean wood chips/sawdust or a clean soil/peat mixture. 2. Ensure a moist environment for the roots. In the true bare-root state, the roots will dry out very rapidly. Dry roots = dead strawberry plants. However, too much moisture will rot the roots. Rotten roots = dead strawberry plants. So, by covering the roots and then regularly applying enough water to keep the roots moist (but not waterlogged), your bare-root strawberries will likely be vibrant when warmer temperatures come in the spring. 3. Store in a hospitable climate. Temperature dictates a strawberry plant’s seasonal cycle. The worst thing for the longevity of a strawberry plant is to revive it from its dormant state prematurely. In order to keep it dormant, it must be in a cool home, yet protected from extreme temperature. One of the best places to store bare-root strawberry plants is in a root cellar. If a root cellar is unavailable, an unheated garage or basement will usually do the trick. But, if the temperature rises and brings forth the strawberries from dormancy and a cold snap follows, they will likely suffer cold injury and may die. If you need to dig up your strawberry plants due to a permanent change of location or some other reason, the best way to do it is to transfer entire plants. To do this, protect the strawberry plants as discussed on the Growing Strawberries page. Then wait until a few frosts have occurred to ensure that the strawberry plants are fully dormant. Following the frosts, use a sturdy trowel to dig up both the dormant strawberry plants and most of their central root system. Put them in cheap plastic pots and store as mentioned above. This will help speed the re-establishment process when you plant them out again in late winter/early spring. The downsides of doing it this way are extra equipment costs (plastic pots and maybe some potting soil) and more space. To emphasize the fragility of true bare-root strawberry plants, consider the care that the major nurseries must give to such plants in order to ship them safely to consumers. In order to keep bare-root strawberries alive just long enough to make it to their new homes, the nurseries will wrap the roots in moistened paper, put them in moisture-tight plastic bags, put them in their shipping boxes, and then store them in freezers below freezing. The plants are then shipped so that the recipient will get them on a Friday or before so that they don’t die on a truck somewhere over the weekend. So, remember: if you buy strawberry plants in the spring or the fall from an online retailer, get them in the ground as soon as possible (the same day you receive them). 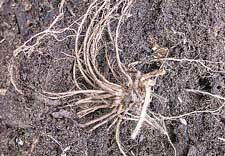 Once the roots are covered, they aren’t bare-root plants any longer and can survive. Last year I planted an acre of certified organic strawberries in plastic mulch. This year we got a great yield. After we renovated the beds (July) into August they went into over drive producing runners. I was surprised to see how many that each plant has made. At this point you can not longer see the beds or paths there are so many runners. I am going to cultivate the paths today which will rip up all of the runners in the paths leaving those in the bed and a few on the shoulders of where the plastic meets soil. My question is now that the plant have put such a large amount of energy into producing runners how much of a decrease in yield should I expect from next years harvest? I also read here that transplanting runners at the end of August is ideal. When would be too late to expect viable runner plants to get established? Would it be preferable to try and transplant the runners now or storing them bare root in a walk in cooler (5C) over the winter? (I am in Southern Ontario Canada, zone 5a, and have about 7 weeks left until my last 10hour day, and typically get a frost in the next 2-3 weeks. PS: This site is a great resource! Thank you. I purchased 75 Ozark strawberry plants from Gurney. When they arrived they were dry and moldy. I planted them in my prepared garden and watered them. A few of them are showing growth, the balance are not. Are they dead? I live near Martinsburg, WV in zone 6b. We recently moved into a house with several plant beds that weren’t well maintained and are full of weeds. I want to pull my plants and completely rework the beds this fall before it gets too cold to rework them and then replant in the spring. I plan to lay down deep mulch (8-12″), so I don’t want to just cover the plants I want to keep. I’m trying to decide on the best method to store my strawberries. I was considering trying to store bare roots in our spare refrigerator, but I had also thought about putting the plants in peat pots, placing the pots on the ground next to a southeasterly facing wall and mulching them well with straw and watering them when necessary. The other thing I had considered was putting them in peat pots trying to eek out space in our garage, though it would likely take a miracle to find enough space in our already over-stuffed garage. Which method do think would be best? I’d like to go ahead and do this, but we are just getting our first frost tonight, and temps in the 20s won’t be seen for quite some time, so the plants aren’t dormant yet. Also do you know if I could store mints and irises the same way? Thanks for your help! In Zone 6b, you still should be able to plant them. My recommendation would be to go ahead and rework the beds as soon as possible, plant the strawberry plants in their new homes, then mulch them when the weather dictates after they go dormant. Unfortunately, I am not sure about mint and iris species! Good luck! The greenhouse might actually provide some protection, but you will still need to mulch your plants heavily to protect them. A full 12 inches of clean straw will help in that endeavor! Good luck! I just pulled a bunch of strawberry plants from my garden in portland, OR and was hoping to try keeping them in my root cellar for the winter. What should I store them in? Paper pag? Straw in the bag? Thanks!!! My strawberry plants are down about 6 inches a 12 inch raised bed. The stems are (about 8 inches) and the leaf canopy allows very little sun to the rest of the plants. I want to move them to another (higher dirt level) raised bed in a sunnier location. You mentioned that 5 years is about the extent of their productivity. Should I just keep the newer ones from runners? I want to store them in the garage for the winter. I was thinking I should just piece together the replies that fit my situation, but thought I’d ask to see if you had anything specific for me. If your plants are producing runners, yes, you can root and transplant them. Good luck! I have been growing my strawberry plants in a raised bed here in N. Idaho and they have survived winters quite well with a thick blanket of snow over them. I plan to move them to an elevated bed late Aug. or early Sept. Will they survive the winter with the cold air under the elevated bed? The beds are 10″ deep. Thank you. They will definitely be more at risk in the elevated bed. You may want to plan on providing extra insulation through the winter months or, if possible, lowering the bed to ground level after the plants go dormant for the winter. Good luck! Hi, bought 40 bare root strawberry plants online. Got here today. I noticed the crowns are a little moist. Some crowns are rot. Do you think it is still be ok to grow? Do I need to cut the rot off? Roots look healthy. If the crowns are rotten on arrival, I would take pictures and contact the retailer from which you purchased them. They will not be likely to grow, and they will probably send you replacement plants. Good luck! No one produces dry root crowns. If the root crowns dry completely out, they will die. The bare-root plants are grown using a variety of methods from clonal reproduction to tissue culture to re-potting of runner plants into a variety of systems. They can even be grown hydroponically. If you are interested in entering production yourself, I would highly recommend contacting your local agricultural extension agent for assistance. They will help you evaluate everything to see if it will work for you! Good luck! I planted 4 strawbales filled with strawberry plants. They did very well here in northern Idaho. However, the bales are becoming to come apart and I would like to save the plants for next year. Since the bales are decomposing it will be very easy to pull the plant fully intact out of the bale. How do I save/store them until spring? If you want to save them for replanting in another hay bale, wait until they go dormant for the year and then follow the instructions on this page. If you are going to plant them in a pot or in the ground, try to keep them happy in the bale until mid-September. Then, carefully remove them and plant in pots or in a strawberry bed. Good luck! If the roots were dried all the way through, they are likely dead. I’d soak them for a day or so and then wrap them in a moist paper towel to see if they bud out. If they do, plant them right away. If they don’t, they are likely already dead. Good luck! Putting the roots in clean, moist sand should work. If the plants themselves are 5 years old, they are likely at the end of their highly-productive years. If that is the case, you may want to replant with new plants to increase yields. Good luck! I’ve grown strawberries in the past and I’ve always picked off the blossoms the first season to get a better crop the following seasons. My question is, is it imperative to pick off the blossoms the first season or can you not pick them off and still get a good amount of strawberries. I’m growing in the hill system and cutting off all runners and from what I’ve been told people pick off the blossoms to encourage runnering, but since I’m planting in the hill system I don’t want runners. You will probably get at least some strawberries the first year if you don’t snip the berries. However, every berry a plant sets takes energy that would otherwise predominantly go into root production. 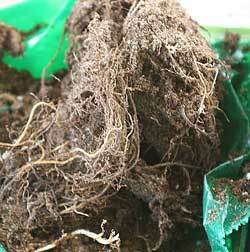 The robust root system is what supports the bumper harvest of berries the following year. Of course, you can do either, but 2nd-year yields usually more than make up for not getting berries the first year due to better roots. Good luck! I have a long time bed of strawberry but am aging and find that bending over is just to hard for harvesting. I want to try hanging strawberries in a ‘gutter’ hanging system. Should I do this after they stop pruducing for the year, fall or spring? And how well would they winter in this fashion? Thank you. Yes, you can transplant them. For best results, transplant them in the fall. As for wintering, it depends on your Zone. In colder Zones, you will need to provide the gutter system with additional insulation. In warmer Zones, you may not even have to insulate them at all as long as the temperature doesn’t drop too low. Good luck! I’m in zone 7 and I had planted bare roots in a “Bag-O-Blooms Grow kit” and layed it flat in my indoor greenhouse by a south facing window. Some started leafing and then a week after they started leafing they shriveled up and died. I water them every few days and always checked the soil moisture beforehand. What went wrong? Were they getting too hot? And if I go get more bare roots can I go ahead and hang them outside, even though our temps drop to the 40’s overnight, will they fare better? It very well could have been the heat, or it could have been too much moisture in the bag/soil. Strawberry plants love temperatures in the 40s at nighttime, so go ahead and plant them outside as soon as possible! Good luck! I’m not clear on what is too cold temperature to plant…. Just received my bare root plants today, is it too cold to plant my bare root plants now? Go ahead and plant! Good luck! I bought strawberry plants from Walmart and the bags say to plant them in Jan/February when ground is 50 degrees. I’m in zone 8 near Dallas and am unsure if I should plant now or put them in the vegetable drawer in the refrigerator? They were stored in the heated area at Walmart and appear to have new growth on them. Thanks for your help. I’d check your ground temperature and see if it is warm enough. If so, I’d go ahead and carefully plant them. Good luck! The answer to your question may be found here. Good luck! I planted strawberries growing in an old wash tub this year and they did great. I have bad soil and just don’t have a place to put them in the ground. I know they will not survive the winter in the wash tub, but we do have a small green house (8X10) I could store them in. Is that a good idea or would it be too warm in there? We grow lettuce and greens in it and don’t keep it very warm. It might be too warm, but the only way to know is to try it and see! If you have enough ground space, you can simply bury your old wash tub, then cover it liberally with clean straw. You’ll have to pull the tub back out in the late winter/spring, but that will simulate strawberries being in-ground. Good luck! No, it isn’t too late! Fall is actually a great time to plant. Go ahead and plant them now! Good luck! I live in Wisconsin what is the best way to take care of my strawberry plants through fall and winter months. I would like to have strawberries ripen around thanksgiving. I plan on having them in an aquaponic greenhouse and I live in zone 7b. Is there any way to “force” strawberries into production during the “off” season? Most hydroponic growers choose a day-neutral variety like Tribute or Tristar. By selecting a day-neutral cultivar, you will get consistent production year-round instead of a large flush of harvestable berries at one time and then basically nothing for the rest of the growing season. You will harvest less overall quantity by weight that way (usually), but you get consistent production. Hope that helps; good luck!